First Lady Wolf Highlights "School Breakfast Week"
Harrisburg, PA – First Lady Frances Wolf today visited Columbia High School in Lancaster County to help kick off the school district’s “School Breakfast Week,” an effort to increase student participation in the district’s breakfast program. 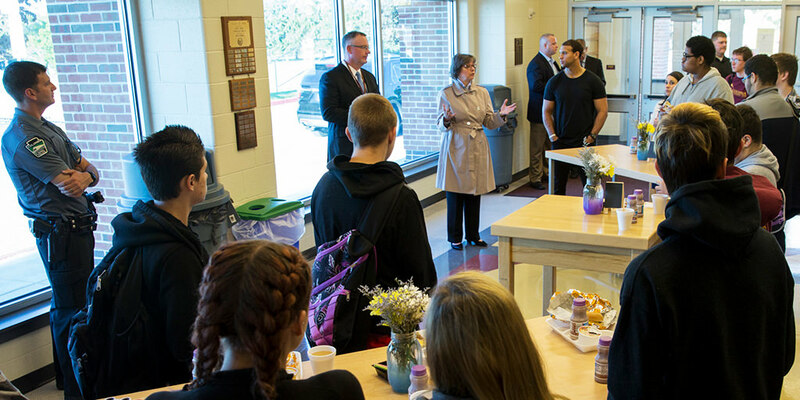 She visited with students and highlighted the importance of breakfast to ensure students have the start to the day that they need to be successful. Governor Wolf’s 2017-18 budget proposal includes an additional $2 million to enhance Pennsylvania’s existing school breakfast programs. This investment will help the Commonwealth leverage tens of millions of dollars in federal funding and will go directly to schools to help them adopt and expand breakfast programs that work. Governor Wolf’s school breakfast budget proposal would be administered through the Pennsylvania Department of Education as competitive grants to schools that adopt alternative breakfast delivery models, including “Breakfast After the Bell” programs in elementary schools and “Grab ‘n’ Go” models in middle and high schools. The funds will be targeted to schools with student populations with more than 60 percent of children receiving subsidized meals. Last year, the Wolf Administration announced its food security plan, “Setting the Table: A Blueprint to for a Hunger-Free PA.” The plan lays out the administration’s goals of providing all Pennsylvanians with access to healthy, nutritious food, which will improve their well-being, health, and independence. One of the key goals of the Blueprint is to increase access to and participation in school breakfast programs for students who are eligible for free and reduced price lunch at school. Studies show that breakfast impacts a variety of outcomes in our children – both in academic progress, as well as behavior and the number of visits to the school nurse every day. School breakfast is a smart investment that will have a lasting impact on our students and on Pennsylvania.